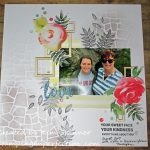 I was trying to find some challenges to participate in and I came across a scrapbook challenge at the Scrap Challenge Yourself blog. I fell in love with the sketch and then checked out the challenge rules. I knew exactly what picture I wanted to use to create this layout! One of the rules was that I have to be in the picture. This is a selfie I took with my son on a quick trip to Boston and a stop at Mystic Aquarium before hitting the ferry to come home. I am not a terrific selfie taker and I felt lucky that he let me take a picture of us together that day. He tends to be camera shy! You can tell that it was a sunny, beautiful day! I used a lot of different companies products on this page! My stash has grown in the variety of what I have and I’m really enjoying experimenting with the new stuff. 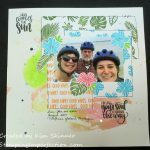 I focused on two things for this layout…bright and colorful geometric designs and I wanted a stamp to show that we were at the aquarium. For my aquarium stamp, I selected the Gina K Designs A Year of Borders. I stamped it using my extra large MISTI and Catherine Pooler’s Aquatini ink. I love this big scrapbook page sized MISTI. Look how straight I was able to get my border stamp along the top. I stamped it 3 times and that MISTI made it so much easier to do! 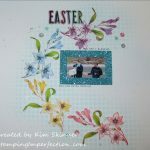 I used one of Catherine Pooler’s stencils called Square Dance along with 4 ink pads that I blended together to get a beautiful rainbow…I used Aquatini, Tuttti Frutti, Tiara, and Flirty Fuchsia which I believe are all part of the Party Collection of inks. Aren’t they gorgeous? They blend beautifully every time I use them. And they stamp like a dream. 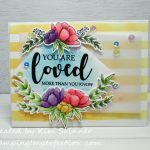 The sentiment is heat embossed in white and it comes from Gina K Designs Your Own Kind of Beautiful stamp set. I love that sentiment because it was his birthday that day and it really expresses how proud I am of him and the man he is. That fantastic die cut title along the side is from Concord & 9th. It is a new release that just came out a couple of days ago. I has a second sentiment die in the set and I love it!! I die cut it in some blue glitter paper. The triangle wood elements are from one of Altenew’s scrapbook kits. That set of wood elements has gone a long way! Those great little sequins are Studio Katia. I love Studio Katia embellishments. 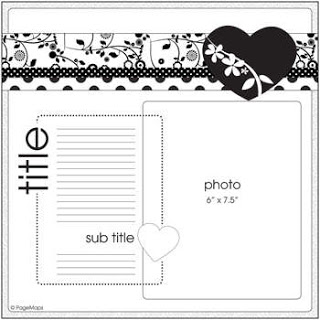 The washi tape is from Stampin’ Up! I like to add the geometrics and the metallic elements when I’m making a layout for a guy. I didn’t want this to be a flowery page like many of the pages I’ve created lately. But I did want it to be colorful and my go to inks for bright, vibrant colors are the Catherine Pooler inks. I loved this sketch. I was able to keep my layout very clean and simple with lots of white space. I also love creating my own background papers and that fantastic stencil was perfect. One new handy tool that I just got and have fallen in love with is the Gina K Designs Lint Free Tidy Towel for stamp cleaning. 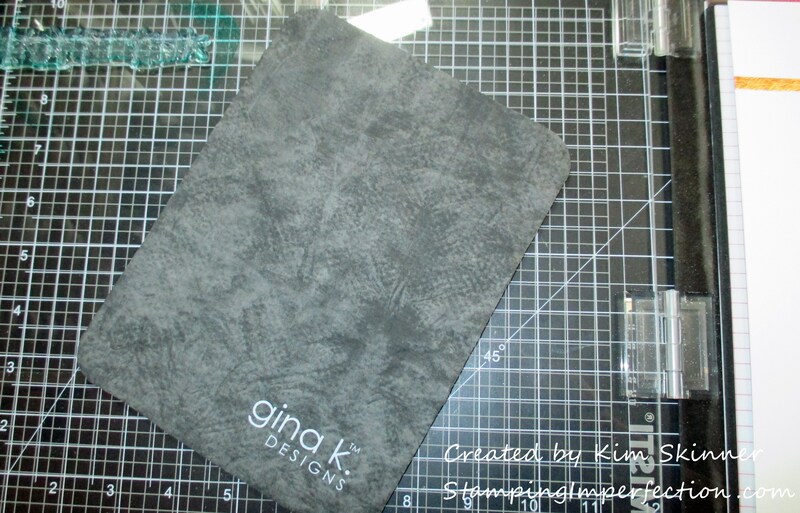 I don’t have a sink in the basement yet near my craft room and this little towel is handy to keep in a plastic bag to clean off the stamps when I use the MISTI. Thank you for stopping by today! Happy crafting! Thank you! I’m glad that I found your challenge! Loving layout, fabulous design and details! Great photo too! Thank you for joining us at Challenge Yourself. 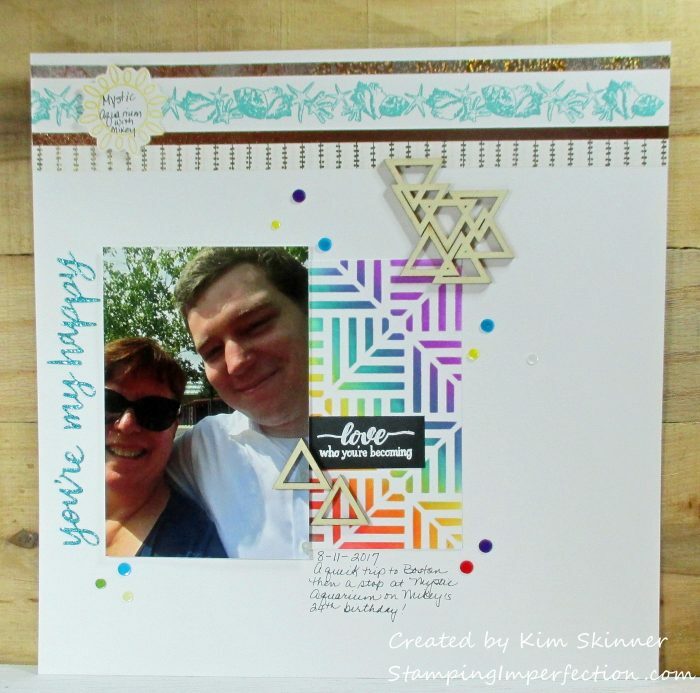 Hi Kim, Welcome to the Challenge YOUrself Blog! LOVE your layout! Great take on the sketch challenge! As a mom of 2 sons – I know what you mean about selfies with them – and this layout certainly captures a very special memory perfectly! Thanks for playing along with us at the Challenge YOUrself Blog this month!! We hope you will join us again! Thank you so much! It’s true about sons!